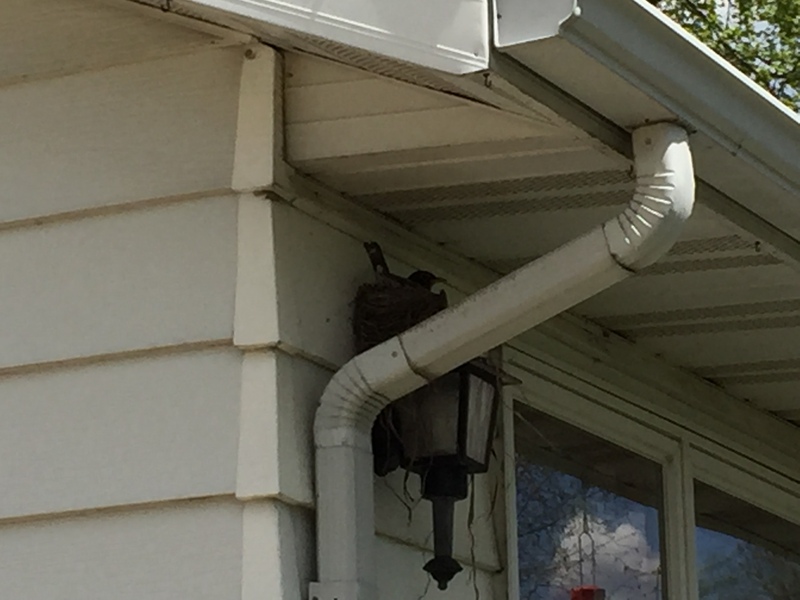 We’ve been keeping a close eye on a robin building a nest atop the outdoor light fixture on the southwest corner of our house here in Tomah. She perked our interest about three weeks ago when we spotted her on the lawn with a big bite of dead grass in her beak. The light fixture is right outside the picture window where I have my desk, computer, and chair. I can look out on Lake Tomah, Butts Park, Tomah Hospital, St. Mary’s Church, the big oak tree in the front yard, and people in cars scurrying off to work. We’re retired!!!! Up flew Mrs. Robin with a beak full of nest-building material. Day after day that nest grew taller and wider. She is one smart robin, as her nest is protected under the roof overhang from the driving rain and raw winds that have frequented Tomah in the past few weeks. She’s been sitting on that nest for about twelve days now. I’m a curious sort of guy, so on Thursday, I taped the iPhone to a long pole and set it on “camera” for a 10 second delay. I waited until she was gone from her nest. Then I pushed the “picture taking button” and moved the pole so the camera would look right down into the nest. 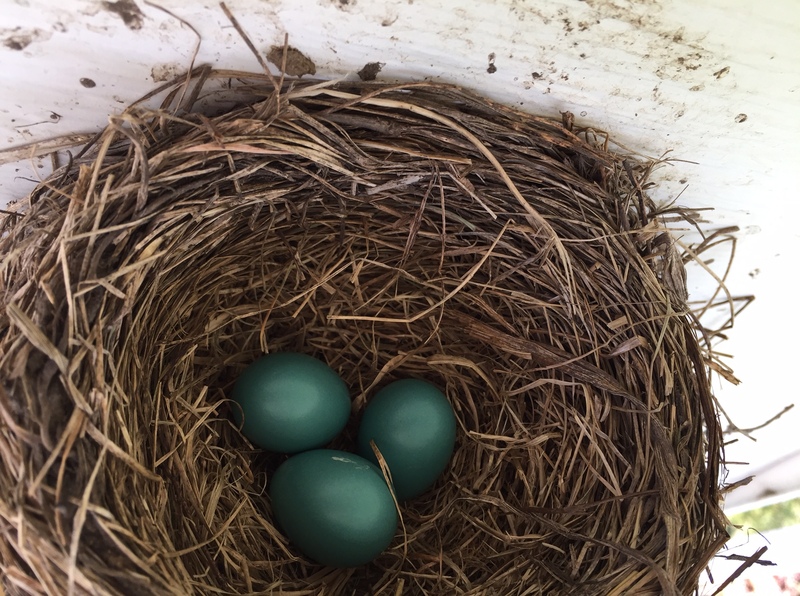 Alas, we find that Mrs. Robin has 3 eggs waiting to be hatched. We’ll put the pole and camera up to that nest in couple of days and check on the progress. Mr. Robin has not been spotted. We surmise that he is down in one of the many taverns in Tomah boasting about his family to be. Perhaps prematurely pasting out robin cigars. He certainly is not away helping with any of the domestic chores.